kt literary » Blog Archive » Happy Book Birthday to IDOL OF BONE! Happy Book Birthday to IDOL OF BONE! 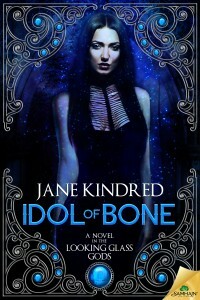 Jane Kindred brings another brilliant, gender-bending fantasy romance to the market with today’s release of IDOL OF BONE. An epic tale of the end of the age of gods, IDOL OF BONE launches a new series called the LOOKING GLASS GODS influenced by ancient Egyptian mythology and packed full of magic and love. Warning: Shape-shifting? That’s so last millennium. Reincarnation? Yawn. Get ready for a gender-bending fantasy that will fire your imagination and haunt your dreams. Jane, congratulations on this wonderful new book! ← SALVAGE is an Andre Norton Award nominee!! !